Best Acoustic Rock Song of All Time Poll: "Blackbird" Vs. "Layla (Unplugged)"
We're out to crown the most beloved Acoustic Rock Song of All Time and we need your help! Today "Blackbird" and "Layla (Unplugged)" go head-to-head. Vote now! 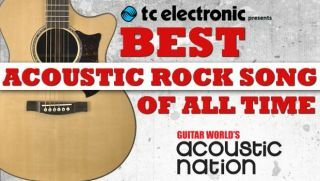 Best Acoustic Rock Song of All Time Poll: "More Than Words" Vs. "Layla (Unplugged)"
We're out to crown the most beloved Acoustic Rock Song of All Time and we need your help! Today "More Than Words" and "Layla (Unplugged)" go head-to-head. Vote now!